Hi Gabriel! 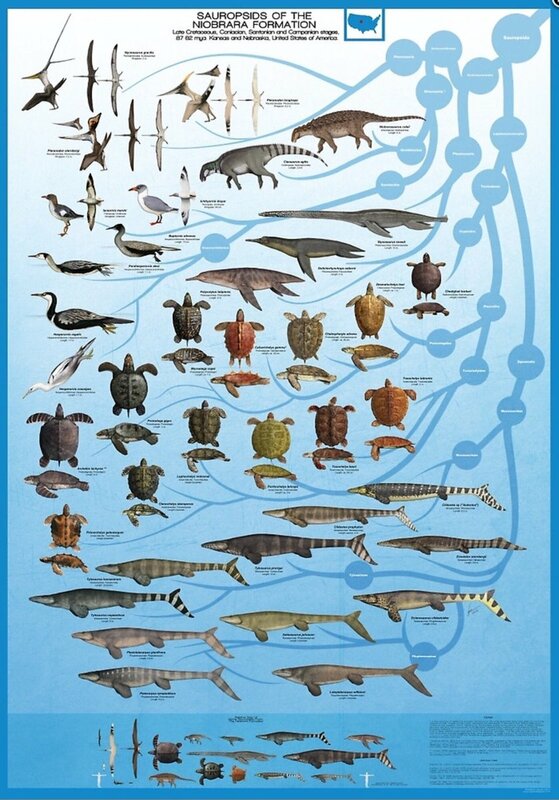 I did this mockup trying to clarify for myself what I dislike about the cladogram design on your otherwise fantastic posters. This is a badly colored mockup with ugly curves… just an exercise on what a cladogram should / shouldn’t do in a use case like this. It should be secondary to the creatures. It should communicate the deep time fluid relationships (what I dislike about the rigid waymarker nodes), their continued evolution or extinction, as well as the relationships of the animals to each other (wherein this mockup is not detailed enough). And it should be aesthetically pleasing. This is the subjective elephant in the room, of course… but I’ve always disliked the representation of an animal in evolutionary flux as a fruit hanging at the end of a branch. Just hoping to prod and provoke, be assured… your fantastic posters don’t really need it.